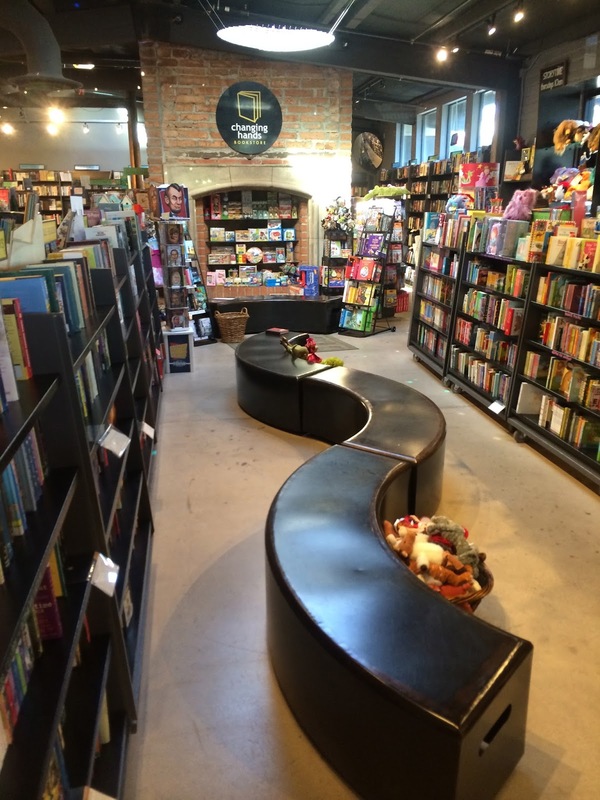 I've often said that there is no cookie-cutter model for an independent bookstore. All shapes, sizes, colors, and genres are welcome to the species. If you come to Lawn Gnome Publishing expecting a shiny, sparking, mega-indie or a chain store like a Barnes & Noble, you will be sadly disappointed. 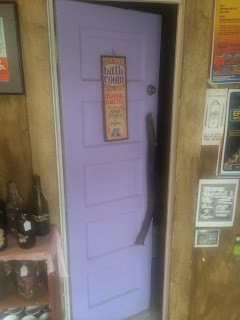 If you come to visit a hip, quirky, unique, fascinating and fiercely independent bookstore, you'll have a great time browsing their collection of used books. 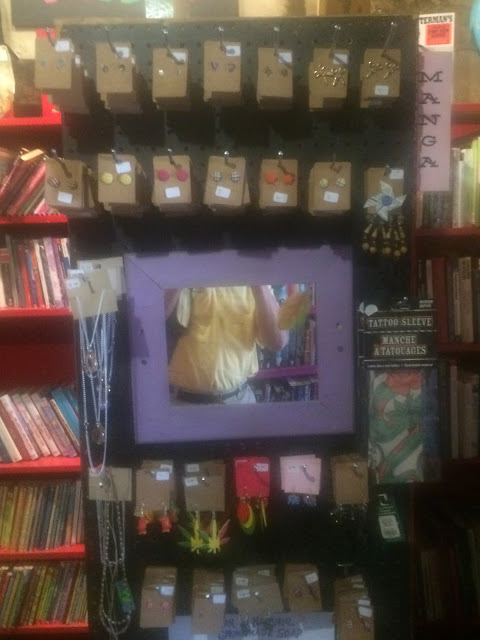 This indie is located in a neighborhood surrounded by those quirky, artsy businesses, all independent. Everything from bikes to art to coffee and now for the last three years, books. If you like visiting eclectic neighborhoods, you'll love this one. Featuring all used books and a few sidelines, the business is housed in a building that was formerly an art gallery and way back in the day was a family home purchased from a Sears catalog. 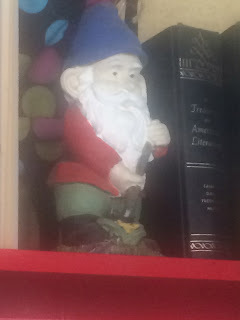 When Lawn Gnome began, the founder and owner, Aaron J., had a staff of volunteers to help with the store. Thanks to its growth over the last three years, he's now able to have a paid staff of about 8, a great sign for this indie. 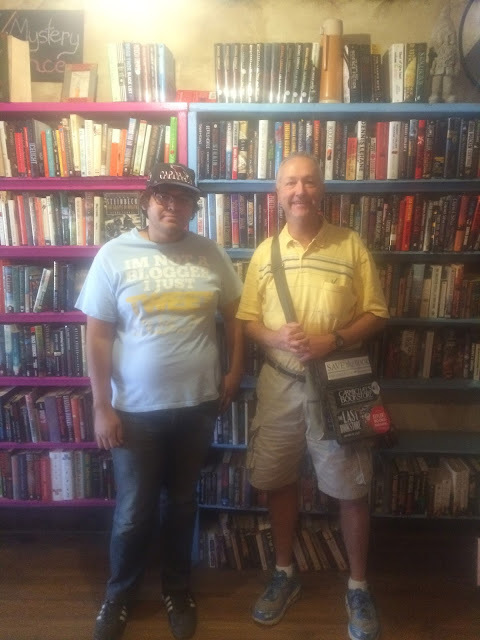 In its short history, they've already won an award for best used bookstore in Phoenix. 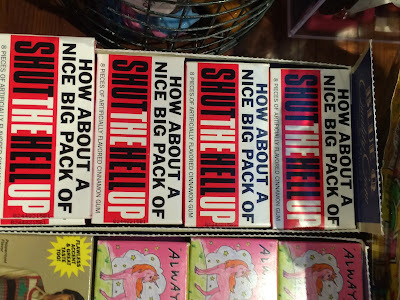 Besides books, the store has a few sidelines like backpacks, jewelry, and fanny packs, but this place is mostly books. 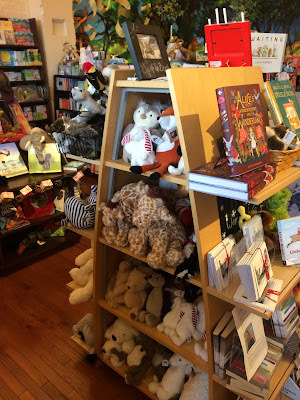 They obtain books from a variety of sources including customers who can earn store credit. 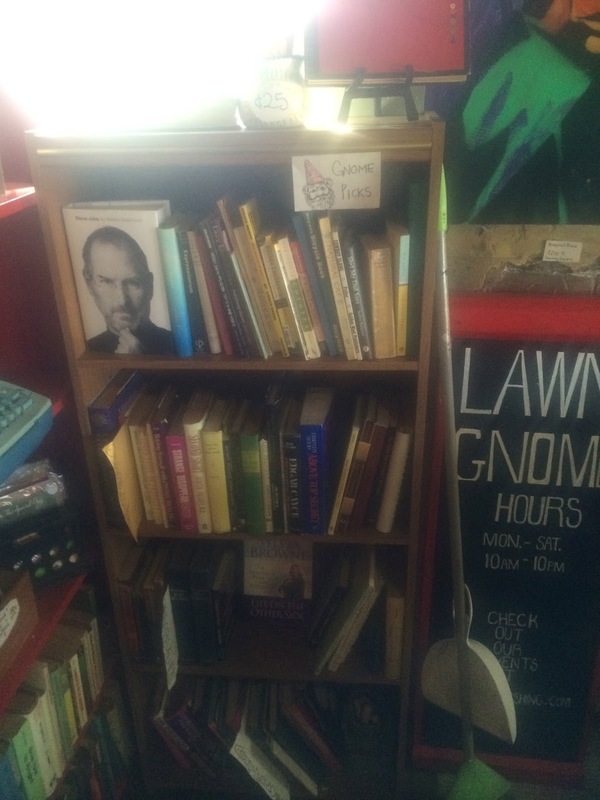 Some books are donated and they're also able to find books at local thrift stores. Everything is on one level divided by small but open rooms. There is a back yard where they are able to host events like open mic nights and slam poetry contests (this is poetry delivered with a pulse or cadence. Maybe a throwback to the beatnik era?). These events are a good source of revenue for the store. 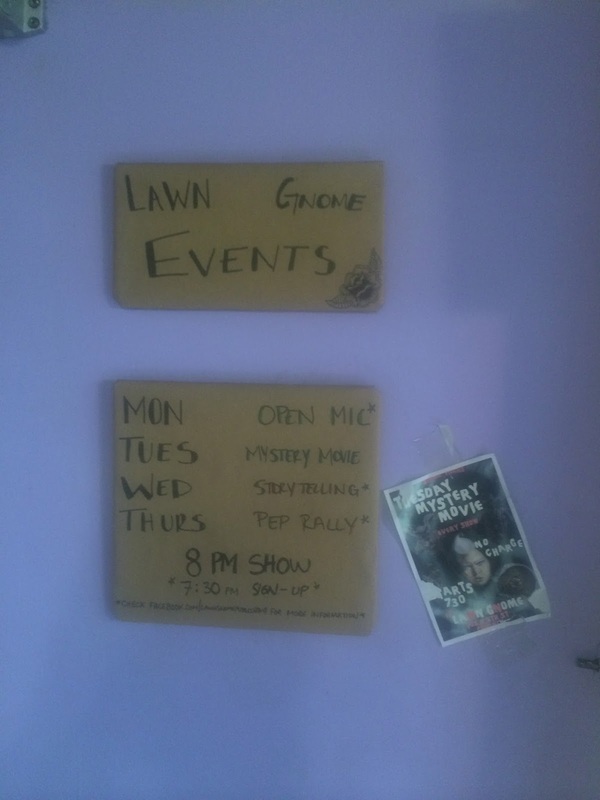 They also feature works by many local authors, including zines, magazines published by Lawn Gnome promoting social causes. I didn't get to meet Aaron J. on this visit but had a great time talking to one of his staffers, Raphael A. I was curious about their customer base and he told me it's a little bit of everything; locals, tourists, and even snow birds (that last one surprised me). Parking is easy to find, free and right on the street. If you extract this neighborhood and plop it down in Brooklyn, NY, or northern California, you'd never know the difference. This place is that hip. But it doesn't matter where you fall on the scale. 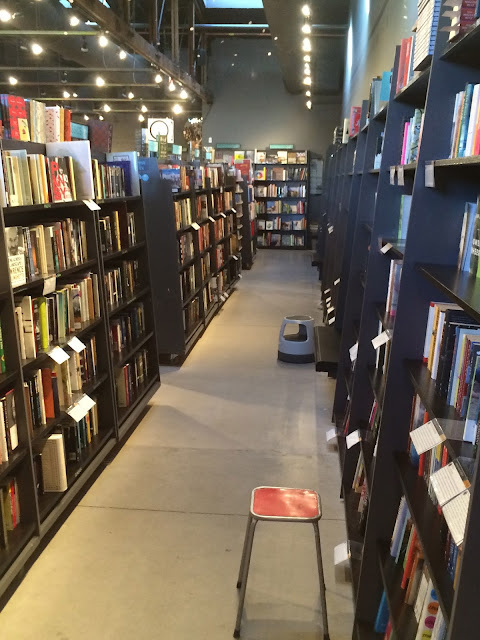 If you want to have an enjoyable experience at one of the country's unique bookstores, check this place out, you'll love it. Go to an indie and buy a book. Bonsoir. JUST FINISHED: Destiny Of The Republic, Candice Millard. Non-fiction that reads like a novel. Story of President James Garfield, his short time in office before being assassinated but surviving for over two months. The medical mistakes made in attempting to save his life and how Alexander Graham Bell tried to help. For history buffs, this is a must read. I loved it. Highly recommended. CURRENTLY READING: Neither Wolf Nor Dog, Kent Nerburn. Look around you, the lawn gnomes will be watching. A few indies I've visited wrap books up in plain brown paper and offer them at a special price. The catch? You don't know for sure what you're getting until you open it. Find this area of the store and find a magazine supporting a social cause. 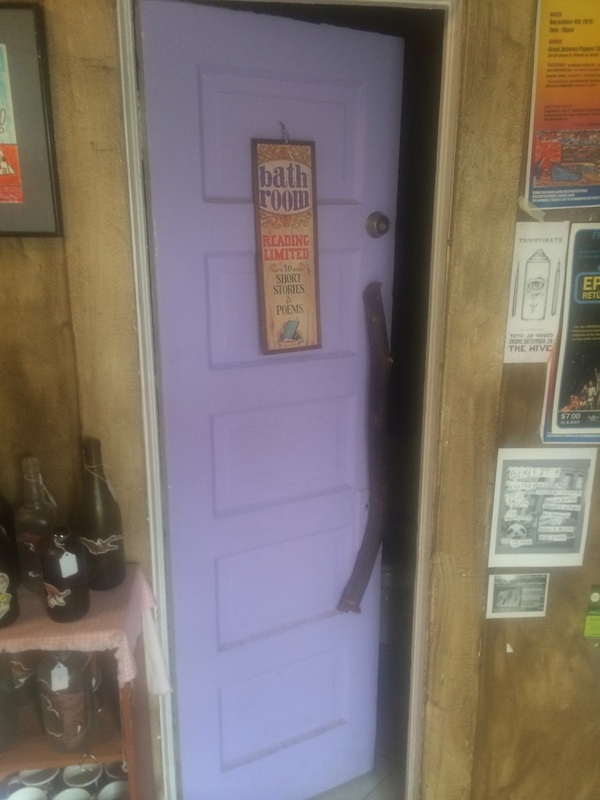 Yes, there is a bathroom. Come here to find a book and attend an event. This is the back yard area and event space. The stage to the right, audience seating to the left. If you want to find out what slam poetry is, come here. You can also test your talents at an open mic night. Here's the view from the stage. Unique! You'll also find a kids section here. A few of the backpacks available. Already an award winning indie. With Raphael on the left, one of the fine staffers. Thanks for a great visit. Prescott, AZ is a town of approximately 40,000. There are, unfortunately, towns much larger around the country that have nothing as nice as this. A few years ago the local Barnes & Noble closed its doors. Enter Peregrine Book Co. who came to the rescue filling the void left by Barnes & Noble and is now getting stronger and showing growth each year. 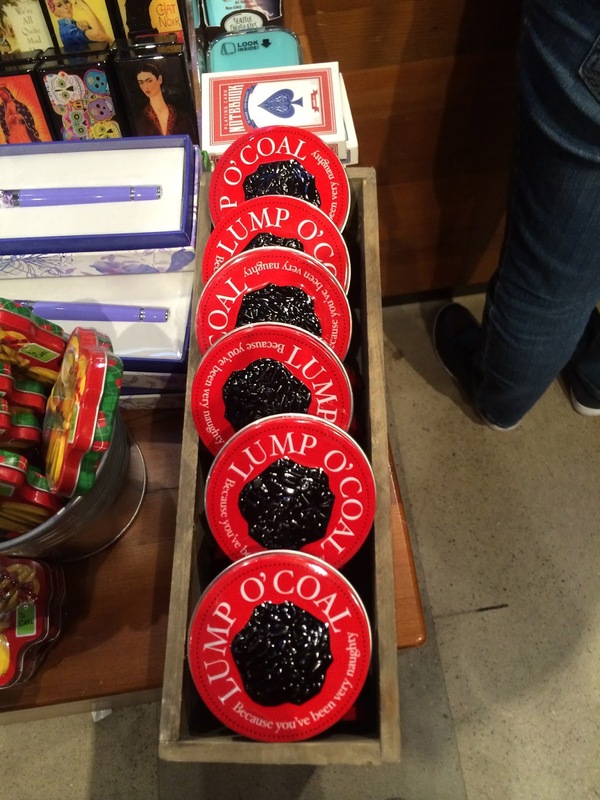 After seeing this store, it's no fluke and no accident. This place compares to the best of them across the country. 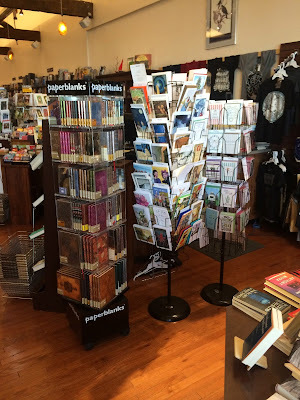 I didn't meet Ty F. and Tom B., two of the founders of Peregrine Books, but I know after talking to others that they know their stuff when it comes to bookstores. Heck, this isn't the only bookstore Tom B. has been involved in starting. He's been a founder of at least three other bookstores, including Changing Hands in Tempe. 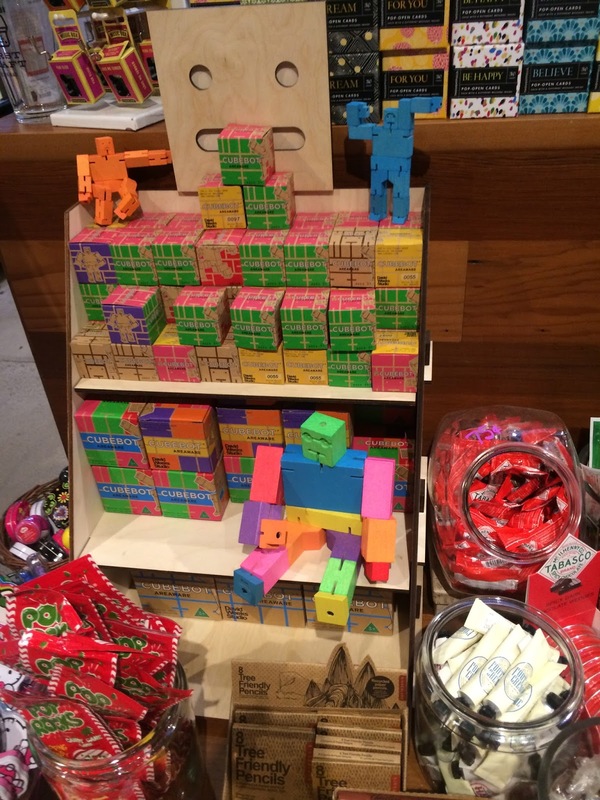 The experience of these two shows in the organization, creativity, design, and neatness of this store. To say this place has been in good hands is an understatement. 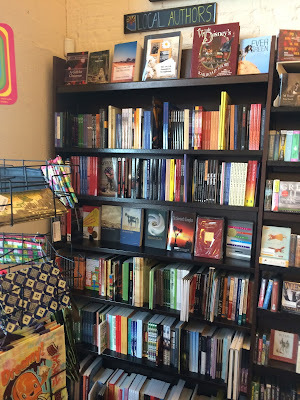 The store sells new and used books as well as publisher's overstock so you can get some great deals. They'll buy your books back if they need them and offer store credit or cash in return. 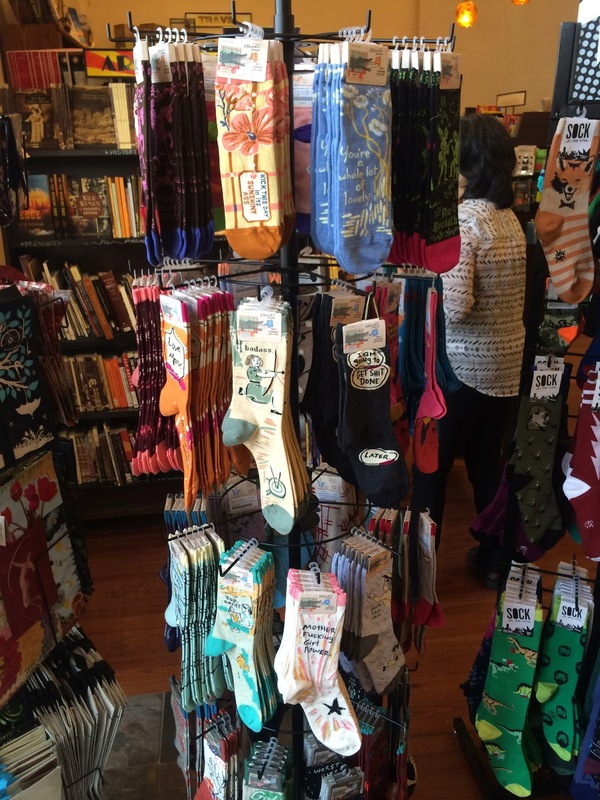 Peregrine Books has a wonderful variety of sidelines including the usual greeting cards, journals, socks, and the unusual like fake mustaches and super hero figurines. 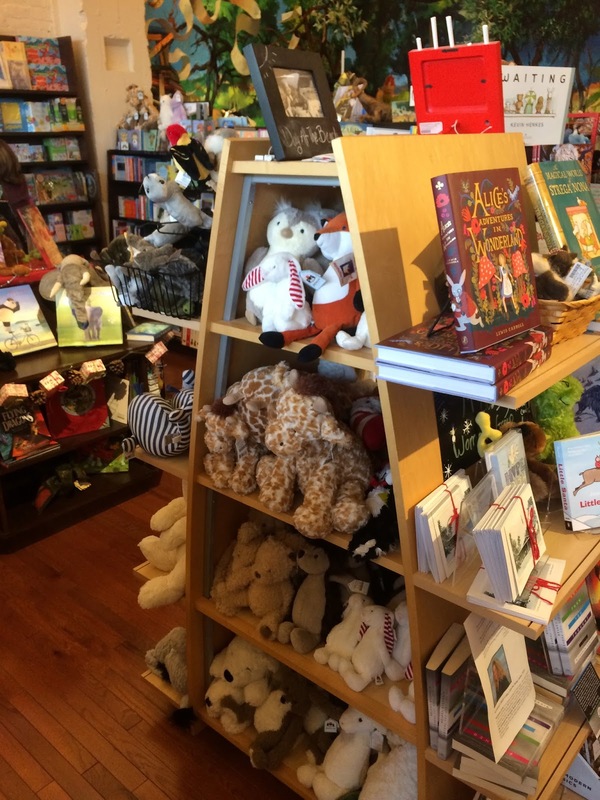 The children's department is doing well here and features a weekly story time. Veri, one of the booksellers, has done a great job with this department and if you need suggestions for a children's book, she's the expert. 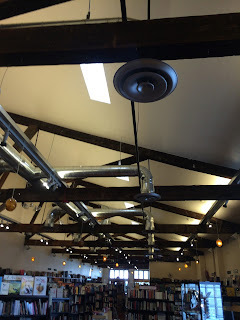 There are frequent author events held here and they have a flexible space in the back of the store that can accommodate at least 80 people. The customer base is a combination of locals, tourists, and transplanted retirees, all contributing to a successful business. I especially enjoy finding easy and free, on-street parking. 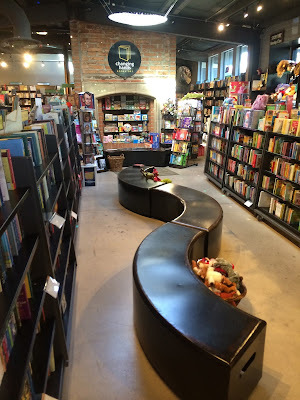 None of my write-ups about these bookstores would be possible without the cooperation of the fine people I meet and Peregrine Books is no different. I met three very nice humans and one incredibly friendly non-human. Reva, the floor manager, along with Cynthia and Veri, two of the booksellers were terrific to talk to, all on a week day morning that saw a steady stream of customers. You'll enjoy talking to any of these three and they will be able to give you MANY book recommendations. And if Cynthia is there, you'll get to meet her dog, Max. If you're unsure which one is Max, just look for his employee name tag. I love it when I see bookstore dogs and if I had an Indie Bob Spot bookstore dog hall of fame, Max would be in it. Seriously, who could resist this cute little guy?! What ever they're paying Max, it isn't enough! Now I've given you two reasons to visit this indie, buy a book and visit Max! Even though Peregrine Books has been here for three years, there are still people in the area that haven't found out about it. Here's what you do. Those of you who know how great this place is, take a friend on your next visit who hasn't been here yet. Then tell that friend to do the same. Repeat ad infinitum. No more excuses to miss this Arizona gem. Go to an indie and buy a book. Bonsoir. JUST FINISHED: The Golem And The Jinni, Helen Wecker. I don't normally read this kind of a book, fiction fantasy. But this is a good one for those who might feel tentative about this genre. Story of two non-humans who live among the people of the lower east side of Manhattan, 1900. How they were created and how they influence the lives of people around them and the connection they share. I enjoyed this one. This Is Water, David Foster Wallace. I've always wondered about Infinite Jest, by this same author but can't bring myself to tackle it. This book is very short and a reprint of the author's commencement address. A good book to read to remind us how to be! CURRENTLY READING: Destiny Of The Republic, Candice Millard. RECENTLY PURCHASED: The Underground Girls Of Kabul, Jenny Nordberg. The Sawtooth Complex, Susan Lang. Great view looking straight through the store from the front entrance. View looking to the right and a large display of staff picks. Have a seat here and try out a book. A portion of the local authors and local interests. Some of the sidelines available, right at the check-out. Your kids are going to love these animal hand puppets. Lots of great sidelines for kids here as well as the books. If your kids like superheroes and comic books, take them to this section of the store. 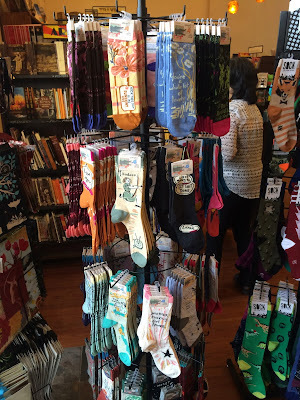 You can find some of the most unique socks in independent bookstores. Bring your book club in and talk about your next book. This is the view from the back of the store looking toward the front. The owners put a lot of time in refurbishing this space. I really like how they did the ceiling. A view of one of the long book aisles. 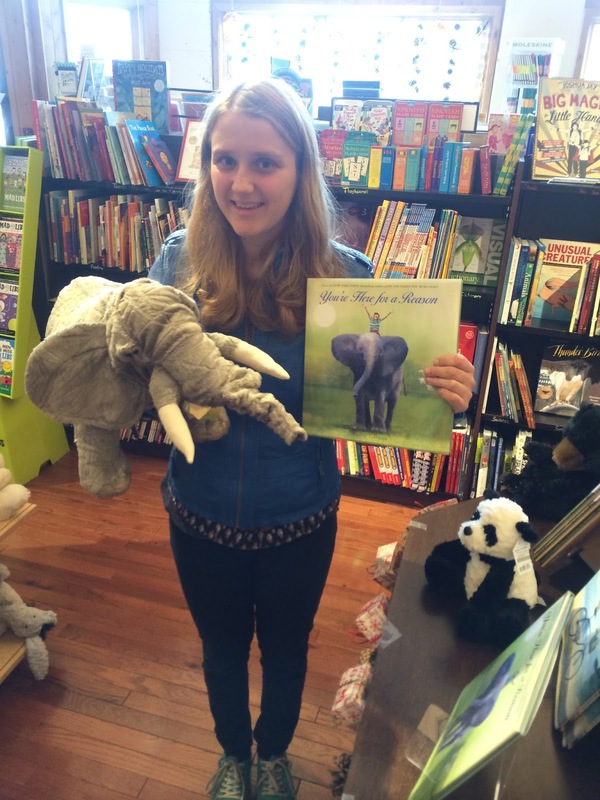 Veri has done a great job in the children's department pairing children's books with the right animal hand puppet. Most indies give back to the community or find a worthy social cause. Another reason to visit. With Reva, the floor manager. Thanks for a great visit. Readers, think of this entry as a second in a series. If you're here to read about Changing Hands Bookstore - Tempe, I encourage you to click on the aforementioned link for additional info. If you're here to read about the Changing Hands Bookstore - Phoenix, you're in the right spot. Same names and same great independent bookstores. Let this be a lesson to always listen to the recommendations given by good booksellers. I wasn't planning on visiting here until Pinna and Brandon at the Changing Hands Bookstore in Tempe said I HAVE to see the new Changing Hands in Phoenix. I was reluctant, but they highly recommended I visit it. Don't ever doubt the recommendations of a bookseller. 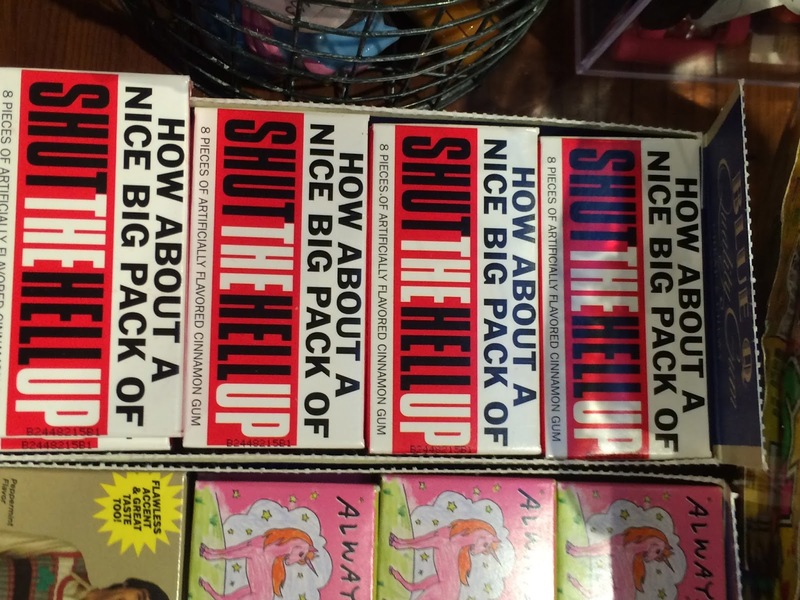 They were spot on and I'm so glad I was able to see this bookstore. If this were a college course I'd deliver a "compare and contrast" essay answer for these two stores. The comparison part is easy, they're both 5-star gems. The Phoenix branch has been open a year and a half and has been riding the success of the Tempe branch but is now enjoying its own successful run. 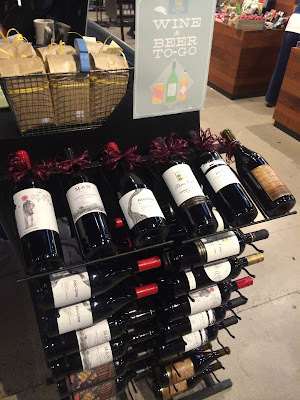 One huge advantage at this store is the beer and wine bar, literally right in the store. I think the more indies that can do this, the better. What better way is there to get customers in a bookstore and buying books than offering alcohol?! Browsing with your beer is encouraged with signs posted around the store. You can also enjoy a coffee or a latté as well. With this bar right in the store, hosting events is a natural fit. 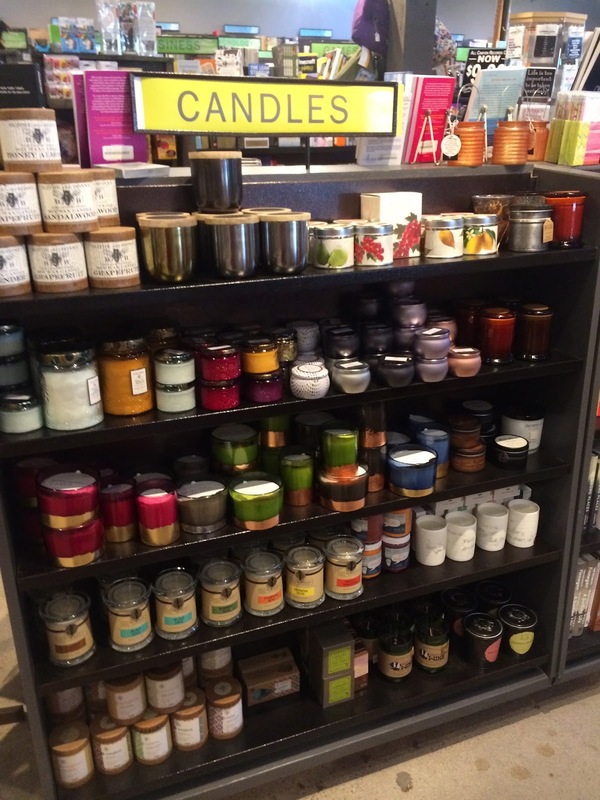 They have a great event space in the store which can also be reserved for meetings, parties, and even weddings. This store is not quite as big as the Tempe branch, but it has everything. A great selection of books, including a very successful children's department that had to be expanded shortly after the store opened. What a great sign this is since these children will become the future custodians of our bookstore heritage. 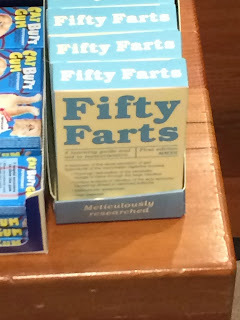 Both stores have as many extraordinary sidelines as I've seen anywhere (come on, who doesn't like something called, Fifty Farts!). Just like the Tempe branch, it's all on one level and offers lots of free and easy parking. As with many of my visits though, the people I meet are the best. Cindy D. is the co-owner of the Changing Hands Bookstores business along with the founders, Gayle S. and Bob S. If you want a model owner/bookseller to emulate for your indie, clone Cindy. She has an energy and spirit that will resonate with any bookstore customer, even the grumpy ones. The result will be a terrific bookstore experience. She's surrounded herself with a great staff, many of who she introduced me to, and they were all wonderful, welcoming, and enthusiastic. I can't thank Cindy and her staff enough for their welcome. Need another example of her expertise? When many southwest region Barnes & Noble's went out of business, she was able to obtain all of their rolling bookshelves, for free. She's energetic, knowledgeable, friendly, and conversant. There's your formula for a great owner/bookseller. So, as long as all of you follow my advice and plan to visit the Changing Hands Bookstore in Tempe, you might as well hop on over to Phoenix and visit this one too. Why visit one great indie when you can visit two! Go to an indie and buy a book. Bonsoir. CURRENTLY READING: The Golem And The Jinni, Helene Wecker. RECENTLY PURCHASED: The Golem And The Jinni, Helene Wecker. The Bassoon King, Rainn Wilson. This is the wonderful events space, also available to reserve for private parties. The bar is just out of view on the right and runs parallel to this space. Then on the other side of the bar is the bookstore. It is an ideal set-up. This is another view from the front entrance. Follow this curvy bench to the outstanding children's section. 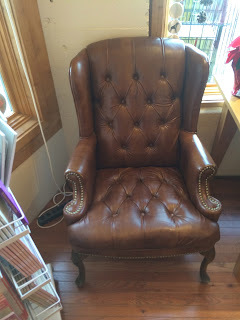 Have a seat here and browse a book with a thought bubble above your head. Or get your picture taken here with those thought bubbles like a couple of newlyweds did. And this isn't the only one of these. These Cubebots are selling well. Build your own robot. 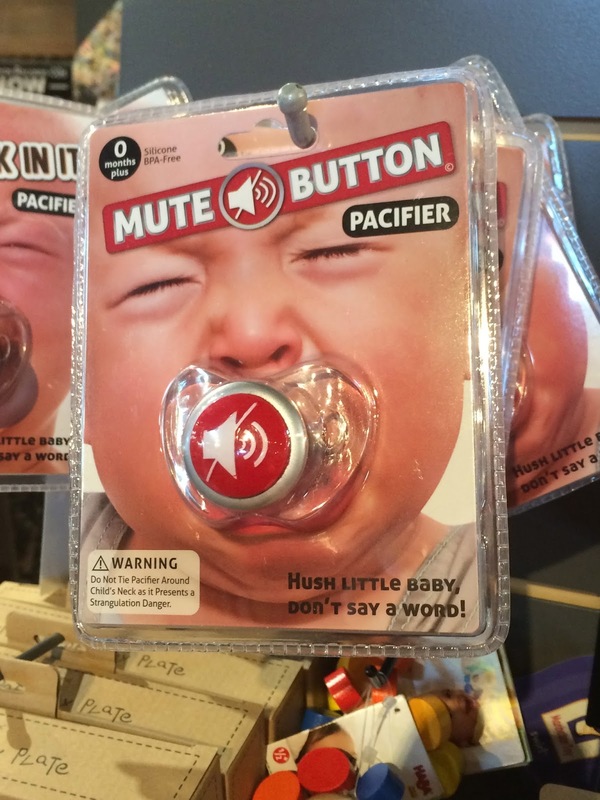 I'll take 239 of these. Why only 239? 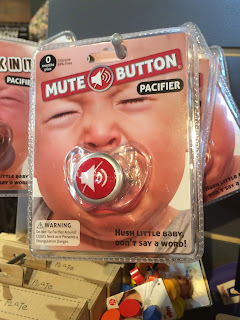 Because one more would be 2 FARTY! Get it? 240? (just work with me here people). This is the bar in the bookstore. On the other side of this bar is the events space. 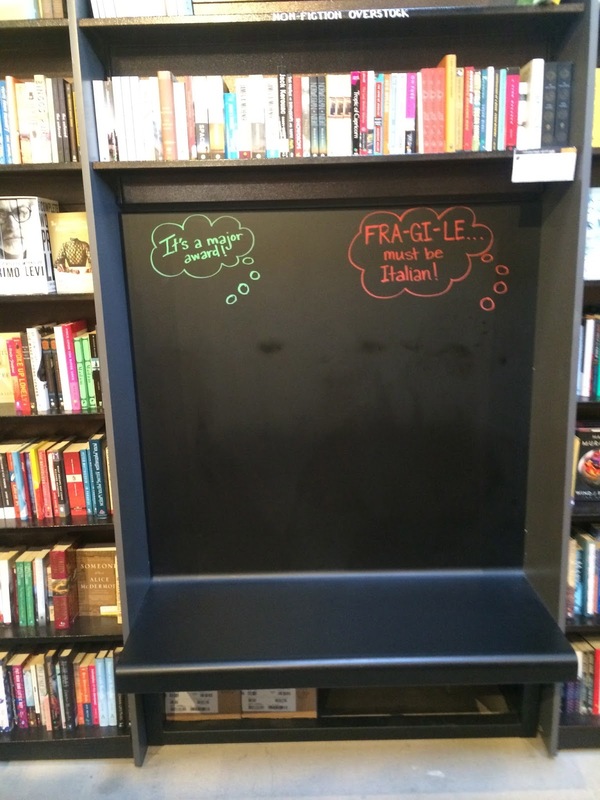 If more bookstores could do this I think it would result in improved sales. Lots of magazines to choose from. I know what you're thinking, Readers. 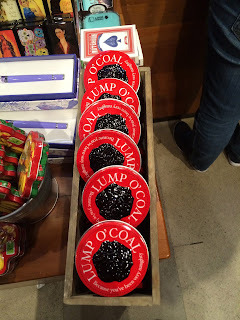 I deserve the "Lump O' Coal" for the lame joke 4 pictures above. 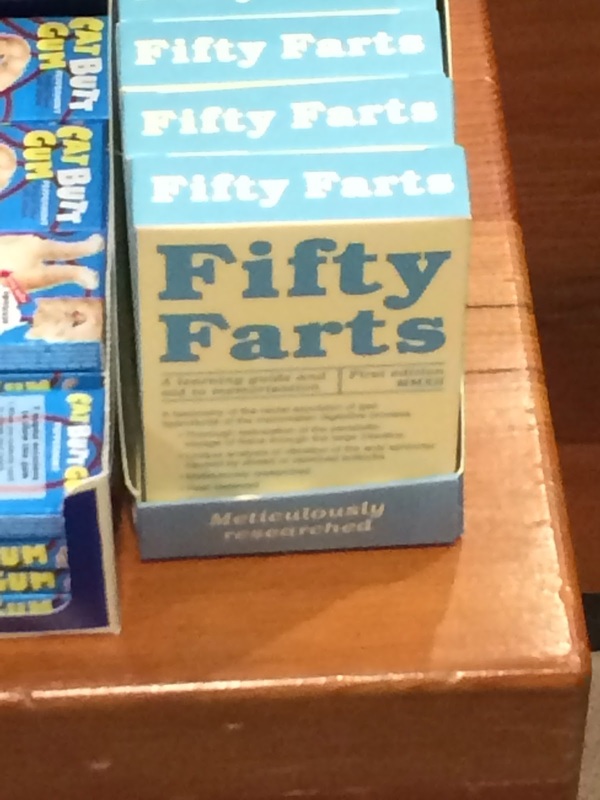 Or maybe you prefer I just get a pack of these! As you can see, the variety of sidelines at both Changing Hands Bookstores is endless. Sidelines available for all ages. A nice view of one of the long book aisles. 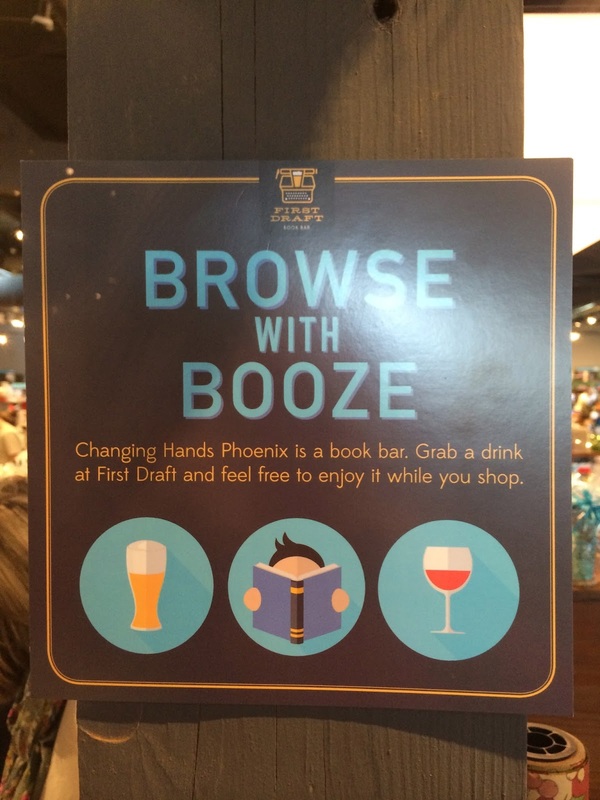 I would change this sign to "Wine and Beer to-go with your book!" 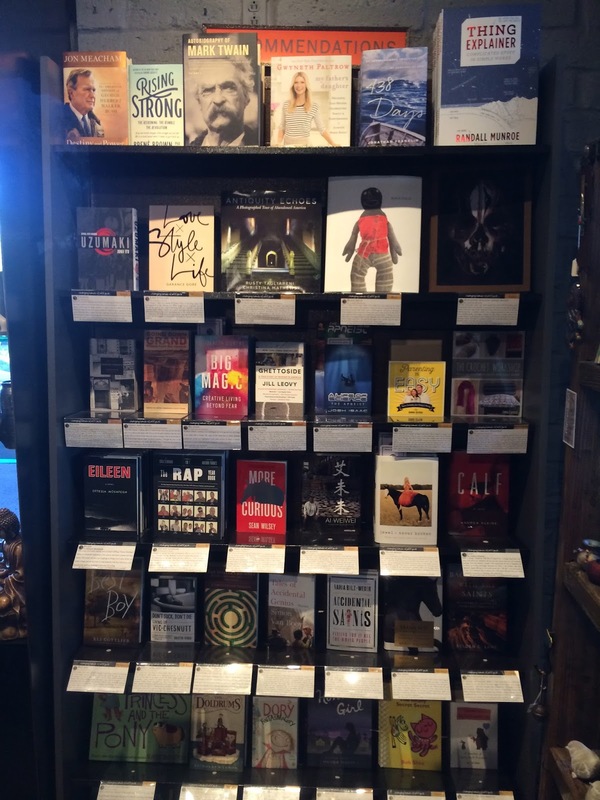 A nice staff recommendations display. 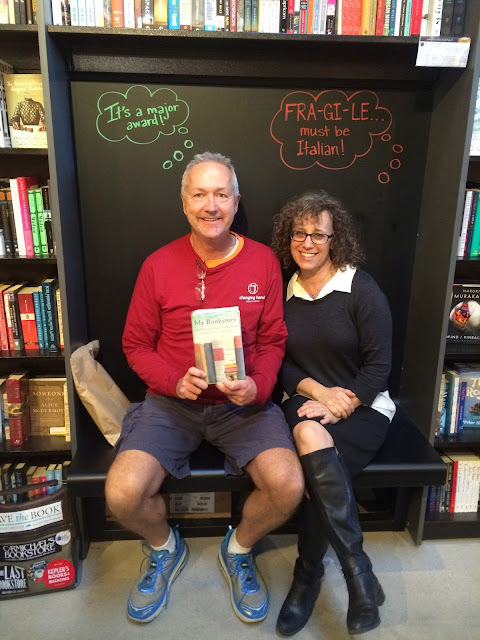 With Cindy, one of the fine co-owners at the Changing Hands Bookstores. Thanks for a great visit.